The British Rail Class 411 (or 4 Cep) electrical multiple units were built at Eastleigh works from 1956-63 for the newly electrified main lines in Kent. These units were based on the earlier Southern Railway 4 Cor design, built in 1937. Variants of the class 411 design included the class 410 and class 412 4 Bep units, which contained a buffet car in place of a standard trailer. 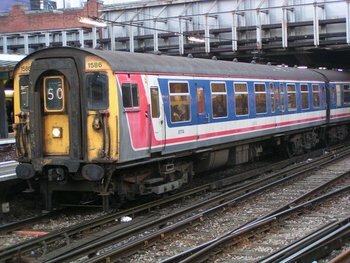 They were later used on services in Sussex and Hampshire; following the privatisation of British Rail in 1995, the units were used by the Connex South Central, Connex South Eastern and South West Trains franchises. They were replaced by Juniper and Electrostar units. The fleet's lifespan was 49 years. These units are the longest-lived BR Mark 1 EMUs. This sound project has been amplified in an attempt to better suit N gauge users. It is recommended that the Master volume be set to suit the individual user. This project is based off a BR Class 411 3rd rail Electric Multiple Units. This loco type was originally used around London and the southwest areas.